You need a processor and you’ve found us. Great! But what is the next step? Here we will break portions of the process down into steps and explain what we need from you and what you can expect from us. The slaughter process is fairly routine regarding each individual species and which enables us to be consistent in our slaughter fees, but there are times when certain breeds or requests mean additional labor and cost to handle. Please see for our policy regarding slaughter surcharges. In addition to the dressed carcass, the only edible products that are saved at slaughter are, Heart, Tongue, Liver, Tail, Sweetbreads(when available). If you want any or all of these items saved from your carcass/s we will need to know that when slaughter is scheduled. Inedible products are generally not saved due to the additional regulatory requirements necessary to do so. Organs are identified with the originating carcass and are packaged the day after slaughter so that they remain as fresh as possible. Organs are not dry-aged with the carcass. Dry-Aging - is available for beef & bison carcasses and the first 2 weeks are included with the price to cut & package the carcass. 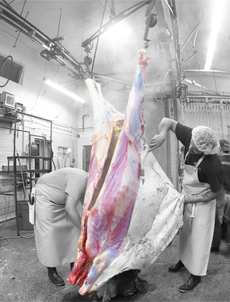 After 2 weeks there is a minimal charge for dry aging and it is calculated based on the dressed weight of the carcass. Please view our policy regarding dry-aging. Hogs are not dry-aged and are cut the day after slaughter. Because there is virtually no hang time for hogs, it is imperative that we receive your cutting instructions the day before slaughter. Orders are entered into our system the day of slaughter and it is important that our staff have all orders in hand so that we can methodically review each order for completeness and accuracy. Customers who have not submitted instructions the day before slaughter will have cutting orders duplicated from previous orders or a standard cutting order that we have established. It is imperative that you call us with your cutting instructions, the week that your animal is slaughtered or the week immediately following. 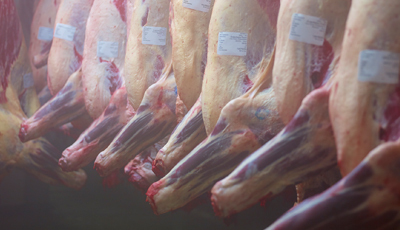 While most of our customers let the carcasses age for 2-3 weeks, having the instructions at or immediately following slaughter helps us to plan our weeks better and complete orders in a timely manner with fewer mistakes. You can fax or email your cutting instructions to us but it is very important that you call our office and speak with someone regarding your order to verify that we received it and to make sure that we understand your order. If we do not receive cutting instructions for beef and bison, and the carcass hangs past 2 weeks, the dry aging policy will be enforced regardless of whether you requested dry aging or not. We will not allow hog carcasses to hang past 1 day and generic instructions will be used if we do not receive cutting instructions within the required time frame. If you are selling portions of a carcass please see our guidelines for cutting options depending on how a carcass is cut. 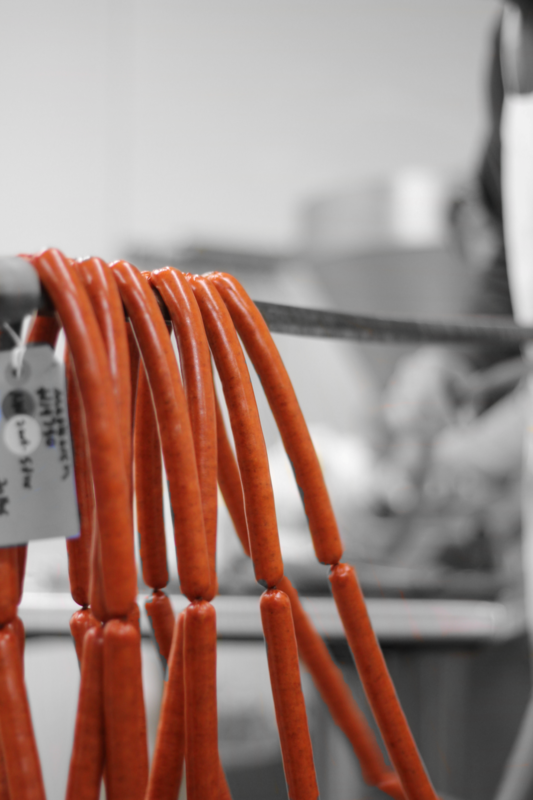 View our hog cutting order guidelines and our beef bison custom cutting instructions memo. Farmers who are selling portions of a carcass can also bill for the carcass in a variety of ways. Please see our billing policy for a breakdown and description of the different options available. We understand that, at certain times, you may require a rush order and we are willing to work with you under these circumstances. We will consider rush orders on an individual basis and in accordance with our scheduled work load. At our discretion, rush orders may incur additional charges. Proper planning and communication will usually avoid rush orders and resulting additional charges. All of the products that we process are vacuum packaged prior to shipment and placed in cardboard boxes. You do not need to bring boxes or coolers in order to pick up your order. We offer both Fresh and Frozen options for your order if you request it. Frozen products encompass the majority of the processing that we do but there are certain markets where fresh product is beneficial and as such we can keep an order fresh and unfrozen. Regular processing encompasses a wide variety of products that are made with cure or at least use standard and economical ingredients. These products may be cured with modern cure or they may contain ingredients that are widely available and used in the industry. No Nitrate Processing produces products that do not contain ingredients such as cure and the product formulations use as many “clean ingredients” that we can source. These products do not use regular sugars or salts but rather minimally processed cane juice and sea salt. Ingredient formulations that use long and unfamiliar names for ingredients are eliminated or minimized. Our goal with No Nitrate processing is not necessarily to imitate regular processed products in visual appearance but to deliver products that are very clearly produced without standard ingredients. Use of our in-house plant generic label is included with your packaging. The label will include all the USDA required elements for an inspected label. Most Farmer Meat Handlers prefer to use their logo/ farm name on our generic label to help differentiate their branded product in the marketplace and provide the consumer with contact information. There is no charge for this service but you will need to provide us with a logo or graphic that will render well as black & white. This labeling option is available in black and white only. 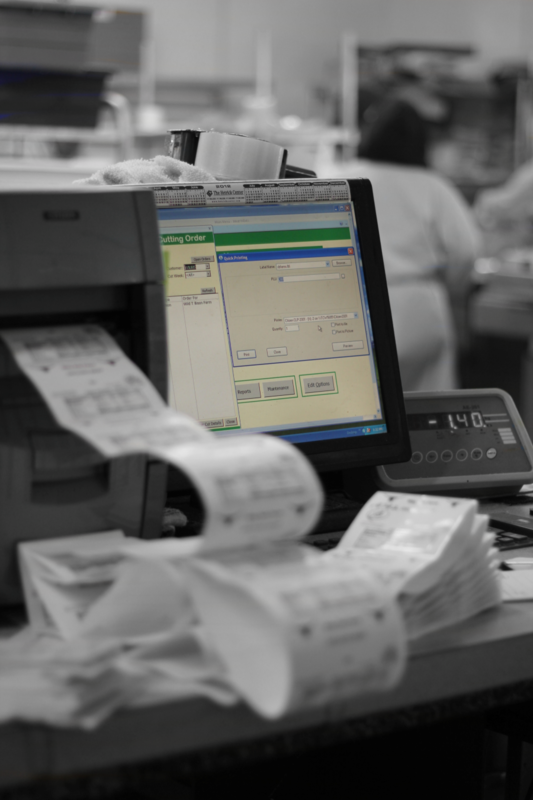 This option does not require you to purchase the labels and keep them in inventory since the labeling machine prints them on demand. Some farmers prefer a custom designed, full color label. These labels have to be designed, printed and ordered from a separate company with relatively high minimum orders, at expense to the farmer. This option is considerably more expensive for the farmer and requires additional time because of the design process. We do not handle any of the design or ordering of these labels as it is the responsibility of the farmer to design and order any color labels from a label design/printing company. If you need a recommendation for a design/printing company, let us know and we will offer suggestions based on what you want to do. The only requirement that we have for custom color labels is that they be of the size and material that will fit and print on our existing printers. The best way to ensure this is to send us a final proof of the label design before printing, and we will approve it for printing or suggest any changes necessary. Some farmers wish to use “Special Labeling Claims” such as “grass-fed”, “pasture-raised”, “no added hormones or antibiotics”, etc. These claims must be approved by USDA/FSIS. Smucker’s Meats offers this application service at a charge of $100 per application (up to 2 different labels per application). This process also takes time so please let us know well in advance. Payment for services is expected at pickup. Payment options include cash, personal or business check, Visa, Mastercard or Discover cards. Customers with returned checks will be charged $20. When your product is finished we will call you and let you know. Your finished product should be picked up within 14 days of notification that it is ready. Please understand that our facility has limited cold storage and we need to keep the inventory in it moving so that we can continue to operate efficiently. Product left in our facility past 14 days after notification will be shipped to a cold storage facility and the cost for delivery added to the invoice. 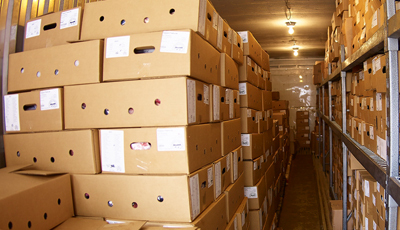 The local cold storage facility that we work with has reasonable rates and will allow you to sort through your order on site and you can pick up only what you need. If there is a cold storage facility closer to you that you would like your products delivered to, please contact us for information and options regarding delivery. 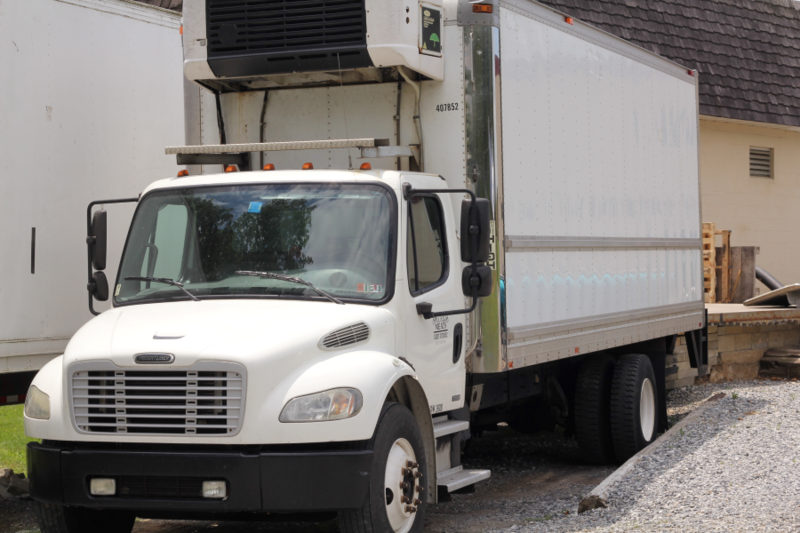 We offer delivery for our customers within a limited distance of our facility and the rates will vary based on distance traveled and the amount of product delivered. Contact us for more information regarding our delivery services. If it is determined that we cannot make a delivery to your location, we do have contacts for local trucking companies that may be able to offer delivery in your area.